This time, we start our process of zooming in to create a more manageable play area. Honestly, while the entire planet is nice to have, if you need it, but it’s really a bit much for a typical game needs. 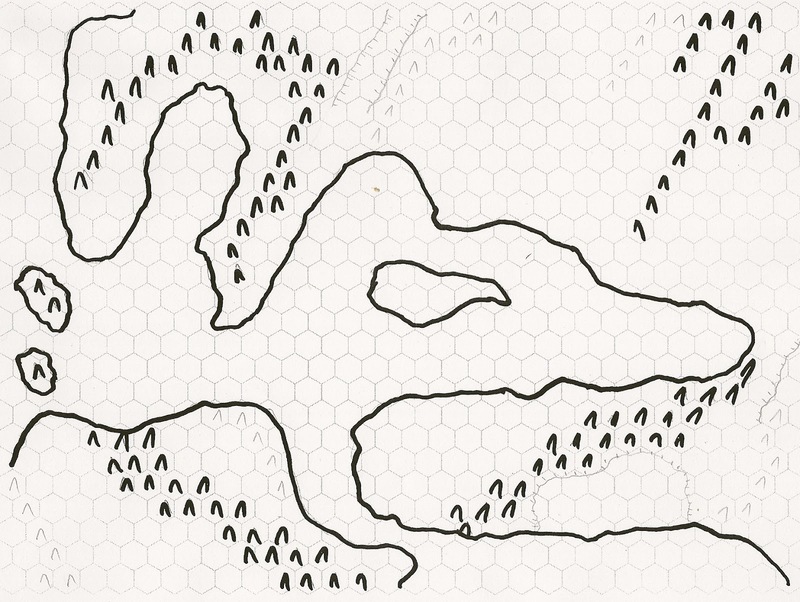 Each of the regions on the map are roughly 6x6 hexes. If each hex is 500 miles, then that works out to about 9,000,000 square miles per region—that’s larger than Russia, and should give me plenty of room for various kingdoms, empires, and empty monster filled regions. I need to pick which of the 20 regions to focus on, and I think I’ll go with 7. It’s got some nice coastlines and peninsulas and mountains. I’m tempted to go with 9 or 14, esp since they’re nearer that bizarre North Eastern Extreme Islands. But, I’m going to go with my gut on 7, since I like the terrain. I can always teleport my players to the east, or something. Now, I skip the first few pages of this chapter—the neat thing about the World Builder’s Guidebook is that you can start anywhere and go either forward or backward, it’s your choice. So, if you have an idea for a city, you can start in that chapter, or if you want to skip the planet and go straight to the region map, you can do that as well. I’m going through it front to back, so in general I’ll be skipping the beginning of each chapter, since these deal with issues that only come up if you’re either starting in that chapter, or coming at it from another direction. First, I need to transfer my region from the World Map to the Region Map. Each of my World hexes is 500 miles, and my region maps are 100 miles. Each region is roughly 6x6. Lengthwise I’m good, but my hex map is 25 hexes in width. I’ll need to cut a row of hexes in either the north or the south. Since those hexes in the south are all water, they’re the ones to go. Each of these is flanked with 1d4-1 lesser systems, 2d4 hexes in length, and 1d4 hexes away from the main mass. So, I add these in as well. Hrrm---ok. This was an odd one. I was going to arbitrarily keep the mountains rather low. I didn’t mind one High Mountain range, but I didn’t really want two. But then I rolled a 100 for the “special characteristics” and got the Home of the Gods. That’s…odd. Not sure what it means yet, but I’ll go ahead and keep it, just to see what comes of it.